Teacup puppies are some of the most adorable puppies you’ll ever lay eyes on. 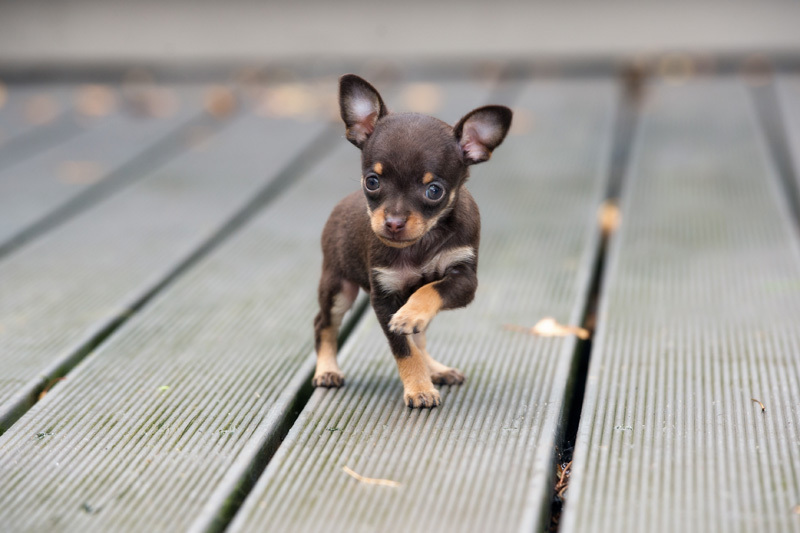 Their popularity is on the rise, but what is a teacup dog? 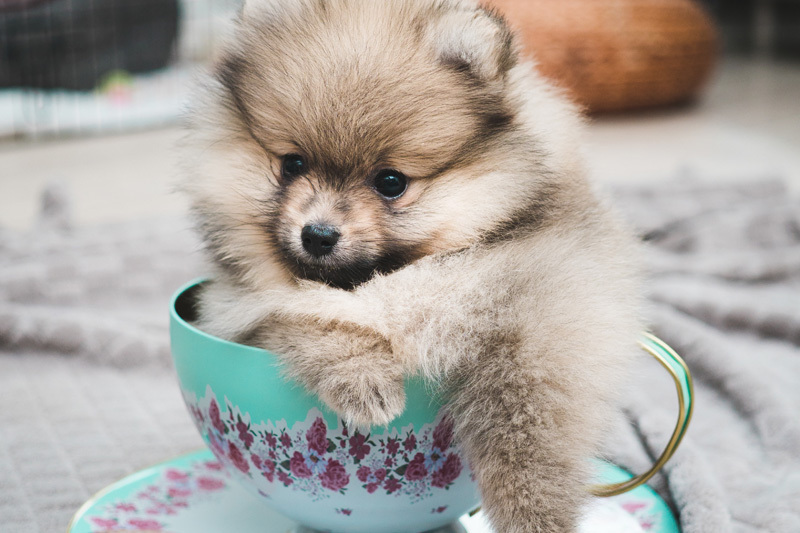 In this article, we’ll explain what a teacup dog is, why they are so popular, and look at a few of the best teacup dogs. There’s no official definition of teacup dog, but a general consensus is that any full-grown dog that weighs in under five pounds qualifies. Teacup puppies are simply miniature versions of your favorite breeds. Hand-held hounds, they are great companions for those who want to bring their dog everywhere they go. So, how do you pick the best teacup dog for you? Fortunately, breed characteristics don’t change just because your dog’s been shrunken. Let’s take a look at some of the best teacup dogs, and what life would be like with these pocket sized pooches. The outgoing and intelligent Pomeranian is well known for being a purse dog, but the breeds history is one of service. The Pom was, at one time in history, a guard dog and herder. You won’t see many of them working the fields these days, but that hard-working spirit can still be seen in their playful enthusiasm around the house. Pomeranian’s make great family companions and their teacup puppy counterparts are no exception. Poms have a loving personality and make great therapy dogs. Their fluffy and adorable appearance make them a favorite of small children. However, their small stature means they are susceptible to injury if dropped or stepped on. Children should always be supervised around Pomeranian’s, especially teacup Pomeranian’s. A big dog trapped in a small dogs body, the Chihuahua is bold and energetic. Commonly thought of as nervous, this is not a traditional breed characteristic. Chi’s should be confident and outgoing. Chihuahuas are naturally miniature, typically weighing no more than six pounds according to breed standards. So, when looking for teacup Chihuahuas it’s important to determine whether it’s a teacup by breeding or simply the runt of a litter. 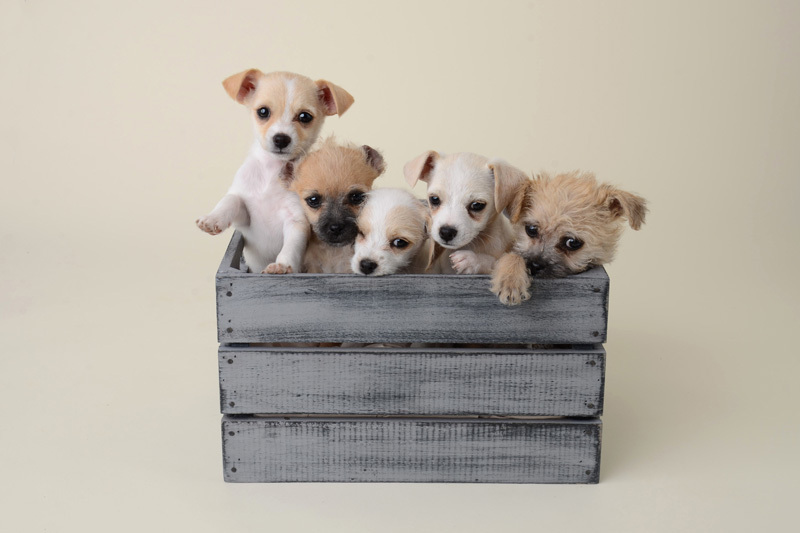 When looking for teacup puppies, the Chihuahua is the perfect breed to consider first. They are intelligent dogs who do well in obedience training and can be tons of fun for the whole family. As with any toy or teacup puppies, it’s important to monitor puppy and child interactions to avoid injuries. The lovable Yorkshire Terrier is an American favorite, consistently in the top 10 of most popular dog breeds. The Yorkie has a hunting pedigree, originally bred for “ratting” in textile factories in England. That independence and ingenuity is present in daily life with the Yorkshire Terrier. With teacup Yorkie’s, that adventurous spirit can lead to some precarious situations. It’s imperative that great care is taken to make sure the puppy doesn’t find itself exploring areas it cannot easily return from. The extrovert personality of the Yorkshire Terrier makes it a fun addition to any family, but the coupled with strong will, it can also be a challenging pet. 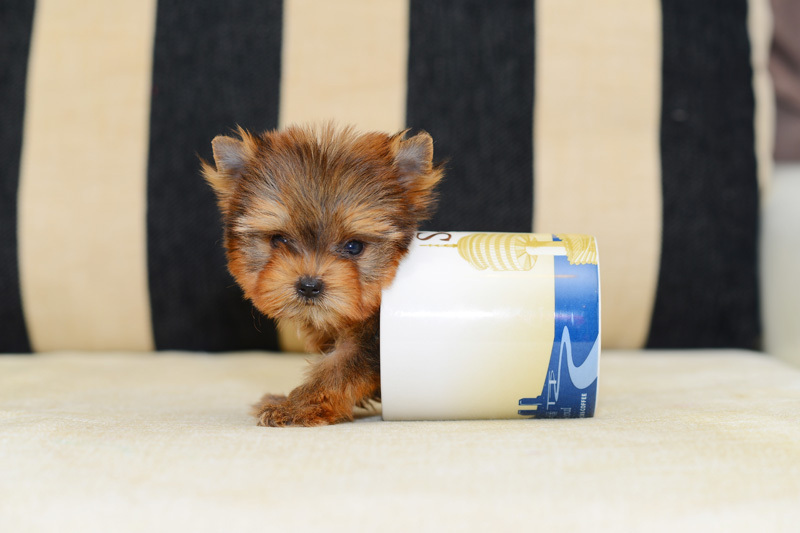 Whether teacup or breed standard, the Yorkie requires firm training from a young age to discourage bad habits, like excessive barking or bad leash manner. With proper training the Yorkshire Terrier can be one of the best teacup dogs for city and apartment life, as they require very little space for exercise and can go just about anywhere you go. The Maltese is one of the oldest toy breeds known and has been a lapdog throughout history. 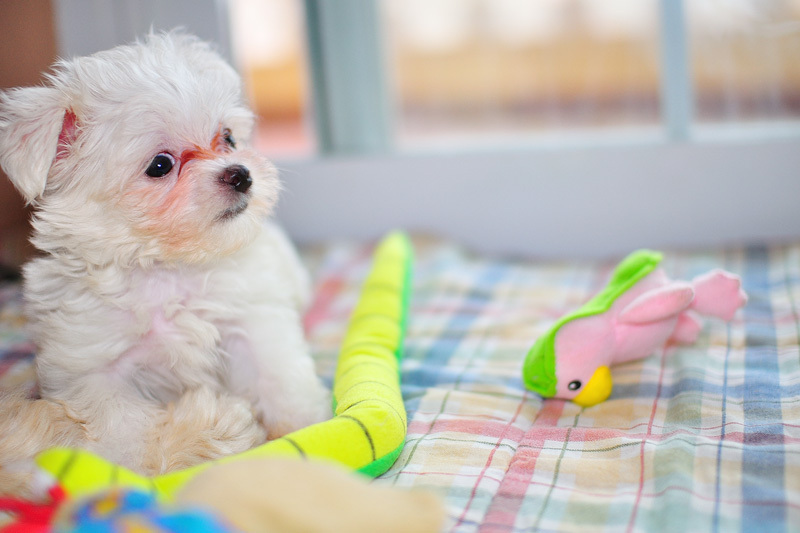 Already small, the breed standard weight for the Maltese is around seven pounds. So, be careful that the puppy you’re considering is a teacup Maltese, not just the runt of a litter. Like the Yorkie, the Maltese makes a great choice for city and apartment life. Maltese are not a low maintenance breed however. They do not require a great deal of exercise, and the teacup variety needs even less space to run, but they do require daily grooming and are prone to dental issues. If you’re willing to commit to daily grooming and dental care, the teacup Maltese should be your short list for the best teacup dogs for you. When properly cared for, they are a majestic and regal breed. 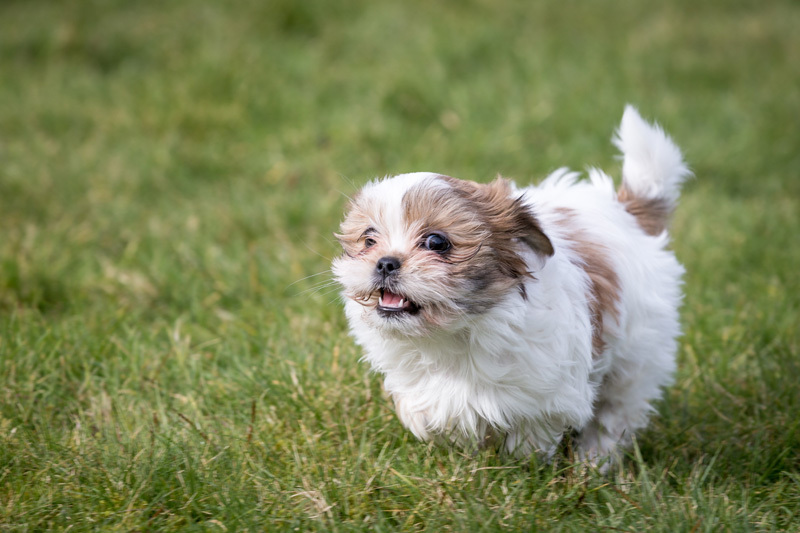 The Shih Tzu may not be the king of the jungle, but its name does translate to “Lion.” Despite the powerful name, the Shih Tzu is the friendliest of the teacup puppies on our list. A low-key dog with an affectionate personality makes the breed one of the most popular in America. The Teacup Shih Tzu embodies all the great Shih Tzu characteristics in a pint sized package. Similar to the Maltese in grooming requirements, the Shih Tzu can be a high maintenance, but generally healthy breed. Life with small children is not ideal, as the breed is fragile and is notorious for getting underfoot. The Shih Tzu is a commitment unlike the other teacup puppies on our list, but the payoff is far greater. If the breed matches your unique lifestyle, this would be our pick for best teacup dogs. Teacup dogs are often as popular as they are controversial. The health of teacup puppies is always a concern for buyers. At The Puppy Store Las Vegas we source all of our puppies with the highest standards, so you can be sure you’re getting a healthy and happy dog. In fact, we stand behind the health of our puppies by offering a lifetime (12 year) puppy guarantee. Contact us today with any questions you have about our available puppies, or take our perfect puppy quiz to see what breed best fits your unique lifestyle and personality. If you’re in the Las Vegas area you can also just stop by and play with the cutest puppies in Las Vegas.